Hello Maple Ridge Realtors and Real Estate buyers and sellers - Where Should we start? Investors are now in full risk reduction mode with money moving out of equities and into sovereign bonds. The trading was triggered by fears of a failing global economy, Ebola, ISIS, and the withdrawal of the US Fed quantitative easing program. Weaker than expected US retail sales basically put a fork in the market on Wednesday, but as they say, what goes down, must come up, and we've seen waves of buying and selling. 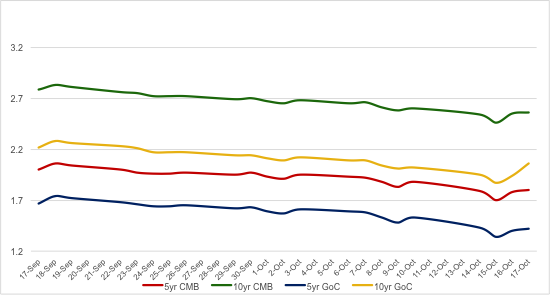 At one point, the 10 year Canada bond was down 20bps to 1.80% from the close last Friday( This directly effects mortgage rates that we pay in Maple Ridge!). Two 'dead-cat bounces' later , the 10yr is trading at 1.91%. (FYI: A Dead Cat Bounce is a small, brief recovery. The turn of phrase is derived from the notion that even a dead cat will bounce if it fall from a great height). 5yr yields are at 1.38% at time of writing Thursday afternoon, after trading as low as 1.27%. Credit spreads have taken it on the chin too. A transparent benchmark would be Canada Mortgage bonds. Spreads on these 'AAA' rated government guaranteed bonds are 4 to 5 basis points wider in recent trading. Lower rated credit has not fared nearly as well. During times like this, a lot of borrowers and lenders alike tend ask where rates might be going next. I read a good answer to that question today: "Unless rates don't go down, they will go down. If they stay up, they won't go down, unless they go down later, which will only happen if they don't stay higher." The way I see it, that analysis should be right, eventually, but then, only temporarily until it isn't.